TRIPOLI, July 28, 2011 The division of Libya into three separate countries is part of the US-NATO imperial design. It is part of a project shared by the U.S., Britain, Italy, and France. The NATO led war, however, is back firing. The Libyan people have united to save their country and Tripoli is exploring its strategic options. Almost all of the text herein was written a few months prior to my trip to Tripoli. It is part of a series of articles on Libya which I have been updating. It is fitting to conclude it in Tripoli, Libya. To be here on the ground in Libya is to be witness to the lies and warped narratives of the mainstream media and the governments. These lies have been used to justify this criminal military endeavor. The mainstream media has been a major force in this war. They have endorsed and fabricated the news, they have justified an illegal and criminal war against an entire population. Passing through the neighbourhood of Fashloom in Tripoli it is apparent that no jets attacked it as Al Jazeera and the British Broadcasting Corporation (BBC) falsely claimed. Now the same media networks, newspapers, and wires claim on a daily basis that Tripoli is about to fall and that the Transitional Council is making new advances to various cities. Tripoli is nowhere near falling and is relatively peaceful. Foreign journalists have also all been taken to the areas that are being reported to have fallen to the Transitional Council, such as Sabha and its environs. The mainstream media reporting out of Tripoli have consistently produced false reports. They report about information from “secure internet services” which essentially describes embassy and intelligence communication media. This is also tied to the “shadow internet” networks that the Obama Administration is promoting as part of a fake protest movement directed against governments around the world, including Latin America, Africa and Eurasia. The foreign press operating out of Libya have deliberately worked to paint a false picture of Libya as a country on the brink of collapse and Colonel Qaddafi as a despot with little support. A journalist was filmed wearing a bulletproof vest for his report in a peaceful area where there was no need for a bulletproof vest. These journalists broadly transmit the same type of news as the journalists embedded with the armed forces, the so-called embedded journalists. Most of the foreign press has betrayed the sacred trust of the public to report accurately and fairly. Not only are they actively misreporting, but are serving the interests of the military coalition. They are actively working "against Libya." They and their editors have deliberately fashioned reports and taken pictures and footage which have been used to portray Tripoli as an empty ghost town. Le Monde for example published an article on July 7, 2011 by Jean-Philippe Rémy, which included misleading photographs that presented Tripoli as a ghost city. The photographs were taken by Laurent Van der Stickt, but it was the editors in Paris who selected the pictures to be used for publication. Le Monde is an instrument of war propaganda. It is publishing material which serves to mislead French public opinion. Sky News is no better. Lisa Holland of Sky News has always used the words “claimed,” “claim,” and “unverified” for anything that Libyan officials say, but presents everything that NATO says without the same doubt-casting language as if it is an unquestionable truth. She used every chance she had to degrade the Libyans. When she visited the bombed home of the daughter of Mohammed Ali Gurari, where the entire family was killed by NATO, she repeatedly asked if Qaddafi was responsible for the bombing to the dismay of those present, with the exception of the reporters who helped paint distorted pictures in the mind of their audiences and readers. She has deliberately distorted the underlying the reality of the situation, blaming Qaddafi, while knowing full well who had killed the Gurari family. Other reports include those of Liseron Boudoul., Boudoul is a reporter for Télévision française 1 (TF1), who has been in Tripoli for months. She reported on March 22, 2011 that all the reports coming out of Tripoli are reviewed and censored by Tripoli. This statement was fabricated. If the Libyans had been censoring the news, they would not have allowed her to make that statement or for her and her colleagues to continue their disinformation campaign. Like all the other foreign journalists in Libya, she has witnessed the popular support for Colonel Qaddafi, but this important information has been deliberately withheld from her reports. Much of what is being passed on as news by foreign reporters on the ground is a mirror of the US-NATO's fake humanitarian mandate. There is a real military-industrial-media complex at work in North America and Western Europe. Most of the media claims are nonsensical and contrary to the facts on the ground. They ignore the realities and hard facts. Were these to have been revealed, people in NATO countries would be mobilizing against their governments and against the NATO led war on Libya. They have helped portray the victim as the aggressor. They use every chance they have to demonize the Libyan government, while upholding the legitimacy of NATO. Essentially many of these so-called journalists are professional propagandists. The mainstream media has also basically worked as an intelligence branch of the Pentagon and NATO in multiple ways. The mainstream media has been party to atrocities and crimes and that point should not be lost when analyzing the war in Libya. British journalists have even been said to have given coordinates for bombings to NATO. Because of its geographic location, Libya has been at the crossroads, a meeting point of various ethnic groups and nationalities, The inhabitants of Libya are a mixed people of various stocks from Africa, the Mediterranean Basin, Europe, and Southwest Asia. Berbers, Egyptians, Greeks, people of Italian descent, people from the Levant, Iranians, Arabs, Turks, Vandals, Hadjanrais, Tuaregs (the Kel Tamajaq or Kel Tamashq), and several other groups have all contributed to the mosaic that constitutes the present population and society of Libya. The genesis of the concept of a Libyan nation as a loosely-knit entity started with the imperial rule of the Ottoman Empire in North Africa. For the inhabitants of Libya it resulted in a shared feeling of similarity that intensified after the Italo-Ottoman War. 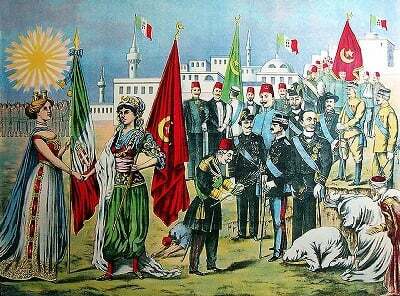 After this war between the Ottoman Empire and Italy, the three Ottoman provinces in Libya fell under Italian colonial control. From the Ottoman and Italian periods onwards up until the years after the Italian defeat the Eastern Libyans had much in common with their kindred in Egypt, while Western Libyans had much in common with their kindred in Tunisia and Algeria, and while Southern Libyans had much in common with their kindred in Niger, Chad, and Sudan. The inhabitants of Libya, however, also had much in common with each other. This included a shared history, a shared language with similar dialects of Arabic, a shared faith, and shared political goals. Geographic proximity and a united feeling of animosity towards the Italians were also important ingredients in establishing a sense of nationhood. Under Italian rule of Libya this feeling of similarity amongst the local inhabitants eventually developed into a national identity as well as a resistance movement to Italian colonial rule. The aspirations of this indigenous resistance were local sovereignty and unity without any foreign yoke. Libya has fallen deeper and deeper into a trap. The flames of internal fighting have been fuelled in Libya with the aim of replicating the same divisive scenarios that occurred in the former Yugoslavia and in Iraq. These plans are also aimed at igniting chaos in North Africa and West Africa in an effort to re-colonize Africa in its entirety. The objective of Washington and its allies consists in confiscating and managing Libya's vast wealth and controlling its resources. The have initiated a foreign-propelled civil war in Libya. Meanwhile the forces of Colonel Qaddafi have regained control of most of Libyan territory. The coaltion then decided to intervene when the Benghazi-based Transitional Council was lying in its deathbed and was in very desperate shape. If it had to, the Transitional Council was willing to make a deal with the “Devil” for its survival. Thus, the Transitional Council embraced its NATO enablers even closer. It must also be asked, which Libyan tribes have publicly sided with the Transitional Council? This is a very important question that allows one to establish the extent of public support for the rebellion. Anyone who understands Libyan society also understands the heavy political weight and representation the tribes have. Also, how many people remain in Benghazi? The demographics of that city have changed since the start of the conflict. Many people have fled to Egypt and abroad from Benghazi. This is not due to the fighting alone, but is tied to a lack of support for the Transitional Council, not to mention the foreign fighters that the TNC has brought, and the lawlessness prevailing in Benghazi. The defeat of the plans to divide Libya at the U.N. would not be the end of the project to divide the North African country. There was still the internal card, division from within. This is where King Idris came into the picture. The federalist system was unacceptable to many Libyans, which saw the new undemocratic National Assembly as a means of sidestepping the Libyan people. Moreover, the elected representatives from the heavily populated region of Tripolitania would be outweighed by the unelected chieftains from Cyrenaica and Fezzan. The official U.S. position was that the so-called “indigenous political leadership” of Cyrenaica and Fezzan enter the National Assembly with the elected representatives from Tripolitania on the “basis of equal representation for all parts of Libya.”  This was Orwellian double-speak that was meant to sidestep the will of the Libyan people. What was being pushed for by the U.S., Britain, France, and Italy was a country similar to the Arab sheikhdoms of the Persian Gulf. If Washington, London, Paris, and Rome had succeeded in their design, modern-day Libya would in all likelihood not have become a republic. Instead Libya would most probably have mirrored the model of the United Arab Emirates, as an Arab petro-sheikhdom in the Mediterranean and the only Arab sheikhdom outside of the Persian Gulf littoral. Thus, effectively Britain, France and Italy have resumed their neocolonial project to balkanize Libya into three separate states. All three countries have acknowledged sending military advisors to the Transitional Council: “Italian Defence Minister Ignazio La Russa said 10 military instructors would be sent and details were being worked out. He spoke Wednesday [April 20, 2011] after meeting with his British counterpart, Liam Fox.”  It is most likely that hundreds of NATO and Gulf Cooperation Council (GCC) military advisors and special troops are operating on the ground in Libya. France has openly admitted funnelling weapons into the Western Mountains to forces hostile to the Tripoli government. This constitutes a breach of U.N. security council resolution 1973. It constitutes a blatant violation of international law. The French government claims that they are sending weapons to civilians to protect themselves. This is a non-sequitur argument. It has no legal standing whatsoever and is an utter lie. This war seeks to create divisions within Libyan society. Admiral Stravridis, the U.S. commander in charge of NATO, has told the U.S. Senate Armed Services Committee in March 2011 that he believed that Qaddafi’s support base would shrink as the tribal cleavages in Libya came “into play” as the war proceeded. What Stravridis indirectly spelled out is that the NATO operations in Libya will cause further internal divisions through igniting tribal tensions that will cement regional differences. This is one of the real aims of the bombing campaign. The U.S. and NATO also know full well that if Colonel Qaddafi is gone that the Libyan tribes would bicker amongst themselves for power and be politically divided. This is why they have been very adamant about removing Qaddafi. The U.S., Britain, France, Italy, and NATO have all banked on a power vacuum that would be left by Qaddafi if he leaves power or dies. This is why they want to kill him. They have calculated that there will be a mad dash to fill the power vacuum that will help divide Libya further and promote violence. They are also very well aware that any tribal conflicts in Libya will spread from North Africa into West Africa and Central Africa. The NATO-led coalition against Libya is supported by covert intelligence operaitons on the ground as psychological operations (PSYOPS) to create internal divisions within the Tripoli government. This is intended to not only weaken the regime and to make it act more desperately, but it is also intended to compound the internal divisions within Libya. Britain’s William Hague has offered sanctuary to any Libyan officials, such as Musa Al-Kusa, that wish to defect from Tripoli and has said that London will exempt them from international sanctions. This British offer of “exemption” also illustrates that the international sanctions against Libya are a political weapon with very little moral or ethical meaning or drive. 1. To bolster U.S. Africa Command (AFRICOM) and a NATO-like alliance in Africa. 2. To control the Transitional Council, which is integrated by an Islamic militia as well prevent the development of an authentic and progressive opposition within Libya. The U.S. and the E.U. would not not accept a truly independent Libyan government. In this regard, there are contingency plans which would allow the US and the E.U., if they so choose, to betray the Transitional Council or dispose of it like an outdated utensil. This is why the Pentagon and the mainstream media have started to speak about an Al-Qaeda presence in Libya. Such scenario of betrayal should come as no surprise. The U.S. and its allies have consistently betrayed former allies. Saddam Hussein is one example and another is the Taliban government in Kabul, which was directly supported by the US. Washington and its cohorts are deliberately keeping the Al-Qaeda card in reserve to use against the Transitional Council in case it refuses to cooperate with Washington and NATO. Regardless of a Transitional Council victory, they also want to use the Al-Qaeda card as a a justificaiton for future military interventions in Libya under the banner of the "war on terrorism". It is very likely that terrorist attacks will occur in Libya in some form like they did in Iraq following its 2003 invasion and occupation. These acts of terrorism will be covertly coordinated by Washington and its NATO allies. In the words of Robin Cook the former foreign minister of Britain, Al-Qaeda is “originally the computer file of the thousands of mujahideen who were recruited and trained with help from the CIA to defeat the Russians [sic. ; Soviets].”  Washington and NATO are now planning to use Al-Qaeda and the militant Islamists that they themselves created to fight countries opposed to their agenda, such as Syria and Libya, and to implant a new generation of subservient Islamist politicians into Arab countries, such as Egypt. This war in Libya has nothing to do with saving lives. Truth is turned upside down: Killing is saving lives, being dead is being alive, war is peace, destruction is preservation, and open lies are presented as the truth. People have been blinded by a slew of lies and utter deception. In this conflict most of the propaganda, most of the lies, and most of the hatred have invariably come from people who are not actually involved in the fighting. Others have been used as their pawns and Libya as their battlefield. All the known advocates of Pentagon militarism and global empire demanded for this war to take place, including Paul Wolfowitz, John McCain, Joseph Lieberman, Eliott Abrahams, Leon Wieseltier, John Hannah, Robert Kagan, and William Kristol. This is not a a humanitarian war: the first target of the war was the Mint which prints and issues Libyan dinars and the country's food storage facilities. Several humanitarian organizations were targetted including schools, a children center, hospitals, the offices of the Down’s Syndrome Society, the Handicapped Women’s Foundation, the National Diabetic Research Centre, the Crippled Children’s Foundation. Among the hospitals and medical facilities which have been bombed is a complex used for medical oxygen production. What is happening in Libya is an insidious process. The underlying objective is create divisions within Libyan society. NATO has now bombed advancing Transitional Council forces several times. The Transitional Council has found it hard to explain why NATO has been bombing its forces and has even been placed in a position where it had to apologize on April 2, 2011 to NATO when its frontline volunteers were killed by NATO war planes. Internal political fighting within the Transitional Council may also be a factor behind these "friendly fire" NATO bombings. In reality there is a virtual stalemate. The Transitional Council is not moving westward, but has also been entrenched in its eastward positions due to NATO support. One objective of NATO is to control both sides. The idea is that as both sides become more desperate they will also increasingly turn to Washington and Brussels for a way out of the war and make more concessions to U.S. and E.U. demands. The Israelis are also another player that can be turned to by both sides in Libya. Both Tripoli and Benghazi have talked with the U.S. and the E.U. through different channels, which include using individuals in unofficial positions. Kurt Weldon, a former member of the U.S. Congress for Pennsylvania, went to meet with Libyan officials at the start of April 2011. Weldon made the trip to Tripoli in coordination with the White House. The U.S. media tried to casually gloss over Weldon’s visit running articles about how he did not meet Qaddafi. At the onset of the fighting Tripoli accepted Venezuelan offers for mediation, which the U.S. and the E.U. undermined and the Transitional Council rejected. Tripoli even said that it accepted an initial March 2011 African Union ceasefire and reform plan, which were ignored by Washington and its allies. Tripoli even requested that the African Union, the U.N., and the E.U. investigate for themselves the claims against the Libyan government. Worldwide, most governments, from Brazil and Nigeria to Malaysia and China, voiced support for a negotiated settlement in Libya, but this has been ignored by the U.S., NATO, and the unrepresentative group of Arab dictators they call their allies. Of significance, Washington does not want to have a visible presence in the war in North Africa. It has deliberately let its allies take the lead in the operation and painstakingly tried to distance itself from the war. It has presented itself as cautious and reluctant to go to war. Washington’s allies are in reality acting on behalf of the Empire. NATO is also in the process of performing the role of global military force acting indirectly on behalf of the United States. It is worth noting, in this regard, that the Director of National Intelligence, in testimony to the Senate Armed Services Committee during a session focusing on Libya, stated that Russia and China constitute “mortal threats” to the United States. The war in Libya is also meant to shore up the drive into Eurasia, which targets Russia, China, Iran, and Central Asia. Libya is the crown of Africa and from Libya there is a perfect opening for the U.S., NATO, and the E.U. into the African continent. U.S. and NATO bases may also be established in the eastern portion of Libya and used as a staging ground for a possible war against Sudan. These bases could be established at the request of the Transitional Council and justified as a means of providing stability to North Africa and as a means of protecting the Libyan people in Benghazi. Washington and the E.U. want to privatize the Libyan public sector under the control of their corporations, take over Libyan industries, and control every aspect of the Libyan economy. On March 19, 2011 the Transitional Council declared that it had established a new Benghazi-based Libyan oil corporation and a new national bank under the auspicious of the Central Bank of Benghazi, which would be responsible for all of Libya’s monetary policies. The new Benghazi-based institutions are an opening for an economic invasion and the colonization of Libya. The Central Bank of Benghazi, which is controlled by Britain’s Hong Kong and Shanghai Banking Corporation (HSBC), could also be given control of the Arab Banking Corporation, which could be used as an umbilical cord by Wall Street and Canary Wharf for infiltrating Libya. The Benghazi-based Transitional Council is already starting the process of exporting oil with the aid of Qatar from the Libyan seaport of Tobruk (Tobruq) near the Egyptian border. The countries and corporations trading with the Transitional Council are all breaching international law. This act is not only intended to weaken Libya, but it also criminal and a form of economic exploitation. A plan to sell rebel-held oil to buy weapons and other supplies has been reached with Qatar, a rebel official said Friday, in another sign of deepening aid for Libya’s opposition by the wealthy Gulf state after sending warplanes to help confront Moammar Gadhafi’s forces. France, Italy, and Qatar have all recognized the Transitional Council as the government of Libya. The U.S., Britain, Germany, Turkey, and their allies have also all given various forms of recognition to the Transitional Council. They are all working now to control the new institutions of the Benghazi administered areas of Libya. The European Bank for Reconstruction and Development (EBRD) is also hovering over Libya under the pretext of furthering democracy amongst the Arabs. They all plan on profiting off the interests from the loans that they are now giving to the Transitional Council. The U.S. and the E.U. are trying to manipulate the Libyan people to their advantage; they are using the Libyan people as cannon fodder. The objective is to create a deadlock and foment chaos across North Africa. Even the sniper attacks on both Libyan sides could be the work of U.S., British, French, NATO, Egyptian, and Khaliji (Gulf) Arab agent provocateurs. The objective is to manipulate the Libyans into destroying their country from the within. The destruction of Yugoslavia, namely the "Balkanization of the Balkans" is the model which is being applied to Libya, leading to its division and political subordination to Washington and Brussels. There have been discussions about splitting the country up, between the regimes in Tripoli and Benghazi. The government in Tripoli would keep everything from Tripoli to somewhere near Misurata, while the Transitional Council would get to administer all the territory in the east running to the Egyptian border. Two parallel Libyan governments are at present a reality. Benghazi already has U.N., U.S., E.U., Qatari, British, French, German, Turkish, and Italian diplomatic missions. As mentioned earlier, the U.S. and the E.U. waited until the Libyan military had reached the doors of Benghazi and the Transitional Council was nearly on its deathbed to take action. This was no mere coincidence. David Owen, a member of the British House of Lords is worth quoting about the timing of the military intervention: “Without it, within hours, Benghazi would have fallen, and [Colonel Qaddafi] would have won.”  This was made to insure the indispensability of NATO to an acquiescent Transitional Council. The supporters of the Transitional Council accuse the Qaddafi regime of being supported by Israel, while they themselves are openly supported by NATO and the Arab petro-sheikhdoms, which oppose democracy and freedom in their own countries. Both sides in Libya have to realize that NATO and Israel, as well as Saudi Arabia and the Arab petro-sheikhdoms, are allies and work closely together against the legitimate aspirations of the Arab peoples. They are merely being played one against the other. Banks have a role to play in this war. U.S. and European financial institutions are major players. The vast overseas financial holdings and sovereign funds owned by Libya are the "spoils of war" accruing to major Western banks and financial institutions. Signs of Hope: Libya’s Promise of Tomorrow. A New Strategic Axis? The Libyans have realized that they need to continue on a pan-African path and to follow a model of self-sufficiency. Many in Tripoli have also started thinking about the future. Old disputes and animosities may also be put aside with other global players that are opposed to U.S. hegemony and opposed to NATO. A strategic axis between Libya, Algeria, Syria, and Iran that will later include Lebanon may blossom as the Libyans begin to explore their strategic options on the political and security levels. Libya has realized that it has made mistakes and now knows that it must find a place in some sort of a global counter-alliance against the U.S. and its allies. Tripoli will eventually try to find a strategic equilibrium for itself in a geo-strategic concept that will balance Russia, China, and Iran. 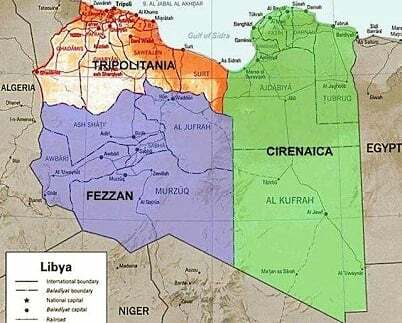 A new strategic concept for the Libyans would also include Venezuela and the Bolivarian Bloc in Latin America. Venezuela, along with Syria, has been Libya’s staunchest supporter during the NATO war. Eventually, Lebanon and Libya will also mend fences. The dossier of Musa Al-Sadr only remains between Lebanon and Libya on the insistence of Nabih Berri. The upper echelons within Hezbollah, including Secretary-General Hassan Nasrallah, have tried not to antagonize Berri and the leadership of the Amal Movement on the issue of Musa Al-Sadr as part of an effort to prevent divisions in the Shiite Muslim community of Lebanon, but if a strategic axis begins to form between Algeria, Libya, Syria, and Iran the issue of Al-Sadr will have to be resolved in Lebanon. In France and Western Europe tensions are also rising internally and against Washington. Gaullism may become reinvigorated in a declining France. The people of Africa have also become even more aware of the exploitation of their continent and the importance of Libya to the rest of Africa. Most importantly, the NATO bombings have helped bring much of Libya together too and have given the nation a new sense of mission. The Libyan people have been reinvigorated with this sense of mission. They have been energized and a revolutionary spirit has been stirred and awakened in the youth. When the dust settles, the people of Libya will begin to weed out political corruption. The worst enemy of all for the Libyans has been the enemy from within. This war has chiefly been against the Libyan people. It has not been the Libyan military that has kept the country standing, but the Libyan people themselves and their resistance. NATO has become tired and faces many internal and external pressures. Italy has now been forced to withdraw from the war. Norway will also withdraw in August 2011. France has even accepted what Paris and NATO refused to accept from the start of the conflict, namely to end the war and to stop bombing Libya if both sides in Tripoli and Benghazi start political talks. In reality, Tripoli has been calling for political dialogue with an entire international chorus for months, but it has been the U.S. and the E.U. that have refused to listen. This also exposes the guilt of the U.S. and the E.U. in waging a war of aggression against Libya. It should also be noted that Prime Minister Silvio Berlusconi has also said that he was told that the war would end when the population of Tripoli revolted against Colonel Qaddafi. This is a significant statement by the Italian Prime Minister. An analysis of cause and effect is very important here. It means that the war did not start as a result of any revolts, but was intended to instigate revolts against the Libyan government. This would explain why NATO has deliberately been targeting and punishing the civilian population. The aim has been to instigate them against Colonel Qaddafi. The security of the familiar is gone. The issue of succession to Colonel Qaddafi was something that the Libyans thought little about or largely ignored prior to the conflict in Libya, but it is now something that has been addressed. If the war never happened, it is likely that there would have been a civil war in Libya once Qaddafi left. Now this is something that has been prepared for. Many of the corrupt people in Libya have also been exposed and have shown their true colours too. Libyans are no longer ignoring these problems as they did before. Libya is not perfect and many of the Libyan people will be amongst the first to admit it. Now many of them are prepared to fix their problems at home for the sake of saving their country, their society, and their families. They face an uphill battle, but they are willing to fight and to make all the sacrifices needed for a better tomorrow. This inner recognition and will to change is the start of authentic change. These people will not give up even if NATO were to launch an invasion or increasing its bombings to devastating levels. Although the conflict is far from over, in the end history will judge the NATO war against Libya as a huge mistake and as the beginning of the end for NATO. Henri Pierre Habib, Politics and Government of Revolutionary Libya (Montmagny, Québec: Le Cercle de Livre de France Ltée, 1975), pp.19-20. Eds. Fredrick Aandahl et al., The United Nation; The Western Hemisphere, vol. 2 of Foreign Relations of the United States 1951 (Washington, D.C.: United States Government, 1979), p.25. Habib, Revolutionary Libya, Op. cit., p.19. U.S. Senate Armed Services Committee, Testimony on the current and future worldwide threats to the national security of the United States, 112th Congress, 2011, 1st Session, 10 March 2011. Los Angeles Times, “3 Western powers sending military advisors to Libya,” April 20, 2011. Louis Charbonneau and Hamuda Hassan, “France defends arms airlift to Libyan rebels,” Reuters, June 30, 2011. Reuters, “Libya orders US diplomat to leave: report,” November 8, 2010. Ibid. ; Voice of America (VOA), “US, Syria Clash Over Ambassador’s Hama Visit,” July 8, 2011; Bassem Mroué, “Syrian protesters attack US embassy,” Associated Press (AP), July 11, 2011. United States Senate Armed Services Committee, U.S. European Command and U.S. Strategic Command in review of the Defense Authorization Request for Fiscal Year 2012 and the Future Years Defense Program,112th Congress, 2011, 1st Session, 29 March 2011; Infra. n.22 and n.61 (the bombings are meant to cause regime change). Infra. n.61; see the omission of the Italian Prime Minister that the NATO bombings are not a result of any revolt, but are intended to cause a revolt in Tripoli against Colonel Qaddafi. Charles Levinson, Ex-Mujahedeen Help Lead Libyan Rebels, The Wall Street Journal (WSJ), April 2, 2011. This information has been passed on through numerous sources on the ground in Libya including members of the Non-Governmental Fact Finding Commission on the Current Events in Libya. Robin Cook, “The struggle against terrorism cannot be won by military means,” The Guardian (U.K.), July 8, 2005. “Arms Embargo – NATO Boarding,” The NATO Channel (May 24, 2011); Mike Mühlberger was the videos producer and reporter. Because of the legal ramifications this video would have NATO removed this video. Stephen Fidler, Charles Levinson, and Alistair Mcdonald, “Friendly Fire Raises Tensions in Libya,” The Wall Street Journal, April 8, 2011. Atul Aneja, “AU begins mediation as Qadhafi forces advance,” The Hindu, April 11, 2011. Elle Ide, “Italy recognizes Libyan opposition council,” Associated Press (AP), April 4, 2011. Simon Denyer and Leila Fadel, “Gaddafi accepts African Union’s road map for peace,” The Washington Post, April 10, 2011. Ian Black, “Libya’s biggest tribe joins march of reconciliation to Benghazi,” The Guardian (U.K.), March 23, 2011; On a personal note, I also was told by sources inside Tunisia and Libya that any people attempting reconciliation marches were attacked. Maria Golovnina, “Libya pledges constitution but Gaddafi role unclear,” Reuters, April 10, 2011. Michael Georgy, “McCain visits rebels, Libya adjusts Misrata tactics,” Reuters, August 22, 2011. Solomon Hughes and Kim Sengupta, “Gaddafi regime staked £12bn on secret deal in bid to open peace talks,” The Independent (U.K.), June 10, 2011. The Daily Mail (U.K.), “MPs rebel over Libya mission creep as Cameron, Obama and Sarkozy promise to keep bombing until Gaddafi regime is gone,” April 15, 2011. Julian Borger and Ewen MacAskill, “No-fly zone plan goes nowhere as US, Russia and Nato urge caution,” The Guardian (U.K.), March 1, 2011.